The insurance industry is largely process-driven and many of these processes require a significant human intervention. These processes include selling, evaluating, analyzing, processing, and activating, policies; customer service and management; receiving, validating, processing or rejecting of claims; and finally settling claim related disputes. Most of these processes are still mostly manual and require a lot of data to be captured, analyzed and processed based on set rules. The data, of course, needs to be updated regularly, should be kept safe, and should be processed accurately, for these processes to work smoothly. This significant dependence on the human workforce, and ever-increasing size and types of data, has brought in several inefficiencies into the system. These inefficiencies are a result of errors, duplication, misinformation, incorrect evaluation, and even corruption. With this context, we are not surprised that several insurance companies are experimenting with the blockchain technology. With properties such as security, transparency, immutability, audit-ability, and smart contracts, this technology can potentially address a lot of problems the industry is facing. 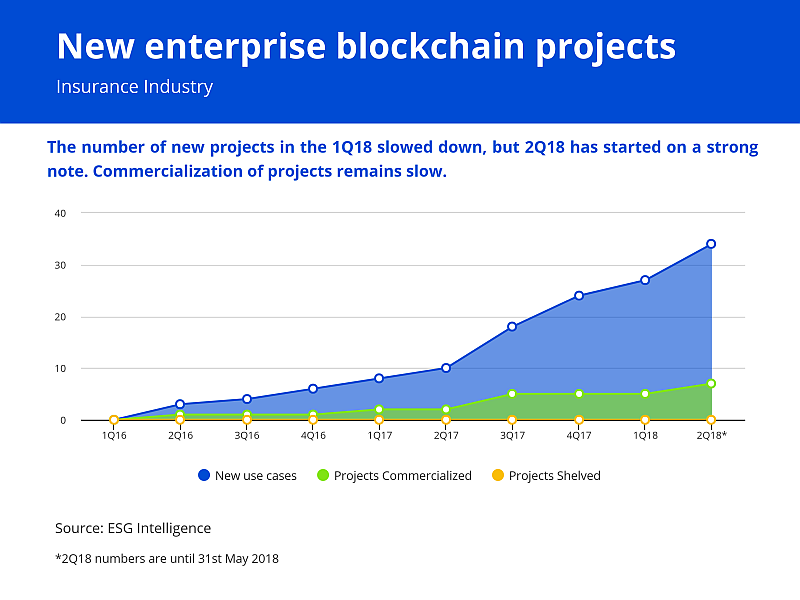 The adoption of blockchain in the insurance industry took off in the second half of 2017 when a couple of projects were commercialized. Several industry stakeholders are participating in the blockchain journey now, and have initiated enterprise blockchain projects for a variety of applications such as KYC and information sharing, healthcare data sharing, claim settlements, catastrophe bond swaps, motor insurance, and flight delay insurance, among others. Information sharing will be easier and faster among the insurers, which will save time and cost. Proving the validity of insurance will be easier for the customers. Control fake and duplicate documentation. Reissuance of insurance will be easier as verifications will take very little time. Claim settlements will be faster and easier. The duration can be reduced to hours instead of days or weeks. Subrogation can be streamlined and will help the insurance organizations get their funds faster. Paperwork can be reduced throughout the industry, driving efficiency and positive environmental impact. Several organizations have come together and formed various consortia to cut costs and develop the solutions faster. It is also encouraging to see that besides the insurance companies some insurance regulators are also proactively participating in these consortia. This should allow many solutions that are commercialized, to be widely approved, well regulated and accepted. We also see a strong potential of integrating some elements of artificial intelligence, especially RPA into the blockchain driven applications, as some of the organizations are already experimenting on these lines. 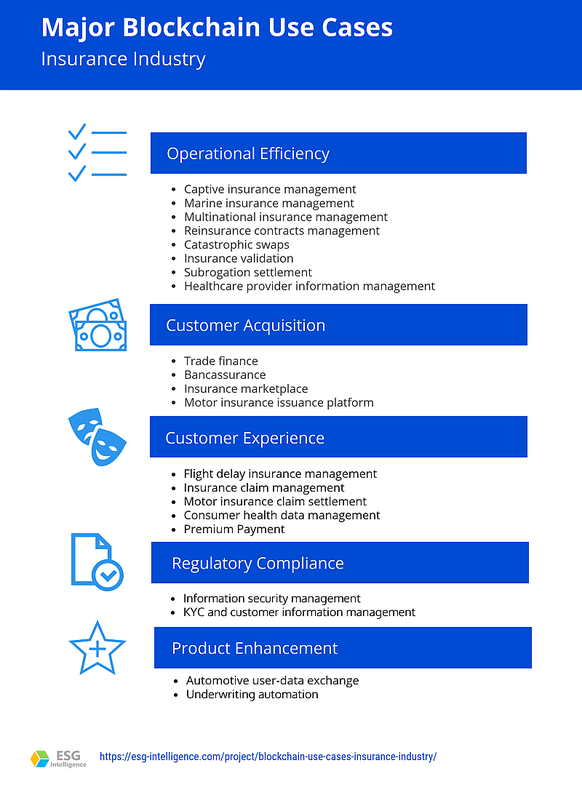 After having been disrupted somewhat, by the emergence of e-insurers and insurance aggregators, the traditional insurance companies look all set to embrace transformative emerging technologies, and by the look of things, blockchain seems to be one strong weapon in their arsenal. 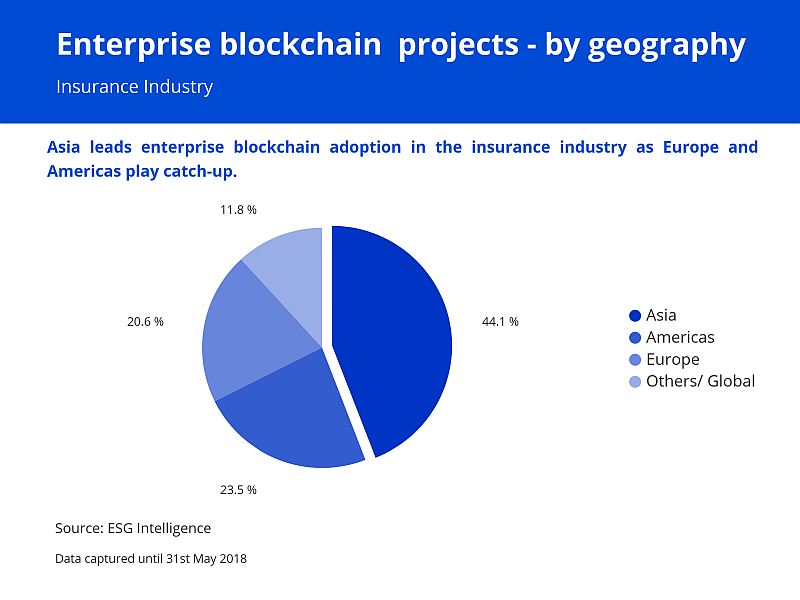 If we look at the geographic split of enterprise blockchain adoption, Asia comfortably leads Europe and Americas. Japan and India are contributing to higher adoption in Asia. However, the USA remains the single largest adopter of the technology as far as individual countries are concerned.